This is one of the most me collaborations I have ever had the pleasure of accepting. Let’s backtrack a bit. A lot of people spend their teenage years going through different phases, trying different styles and experimenting with their looks. I spent my childhood forever in pink as my mother was a big fan. When I hit 12/13 everything changed. I started listening to rock music, wearing dark clothes and makeup, call it my “emo phase” if you like. I don’t think I’ve ever actually come out of my “emo phase” but let’s save that for another time. Hitting 14 was when I started to really want tattoos and piercings. A few friends said the same and we used to sit around and talk about the things we’d get when we were old enough to. I always knew that I meant it though. When I said I wanted to get piercings and be covered in tattoos, I really meant it and I knew I’d go through with it as soon as I could. Flash forward to 22 year old us and I was right. I was the only person that stuck with the vows to get tattoos. I don’t have nearly as many as I want due to medication and money slowing down my progress but with any luck, that should all change soon! There are still so many people that look down on people with tattoos which I’ll never understand. I think they’re one of, if not the most beautiful form of self expression. Why would you not want a wonderful piece of art that you love on your body forever? People make arguments that you’ll look terrible when you’re old – won’t everyone anyway? They say you’ll look horrible in a wedding dress which is simply not true. The most beautiful brides I’ve ever seen, in my opinion, have been tattooed. A lot of people struggle with the idea of committing to having that one thing on their skin forever. I do understand that but personally I love the idea of it! But hey, if you’re on the fence or would love to see what you’d look like with one, this is where TattooedNow come in. 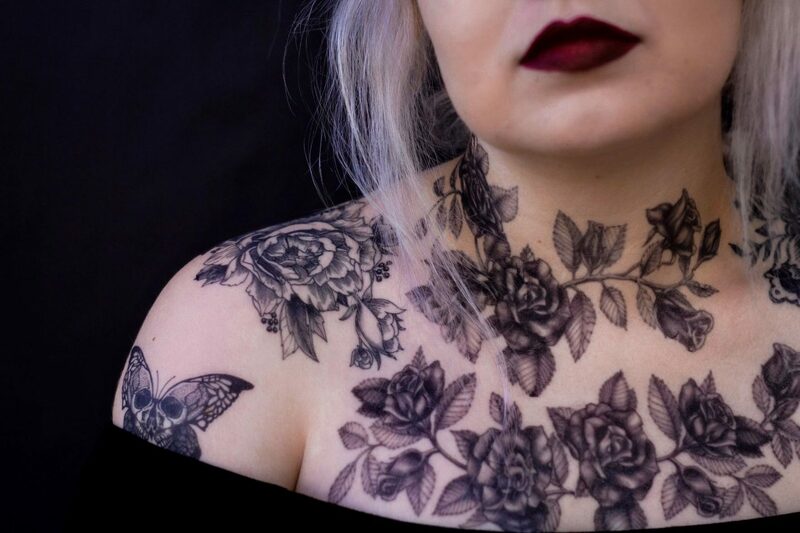 TattooedNow provide the most realistic looking temporary tattoos that are currently out there! They’re designed to be a bit faded so they look as if they’ve been there a while as we all know that fresh tattoos are red, swollen and gunky. You’re not getting away with saying it’s a fresh one! They have a pretty fabulous back catalogue of celebrities who have used their products for all sorts of things such as Channing Tatum, Gerard Butler and Zlatan Ibrahimovic. 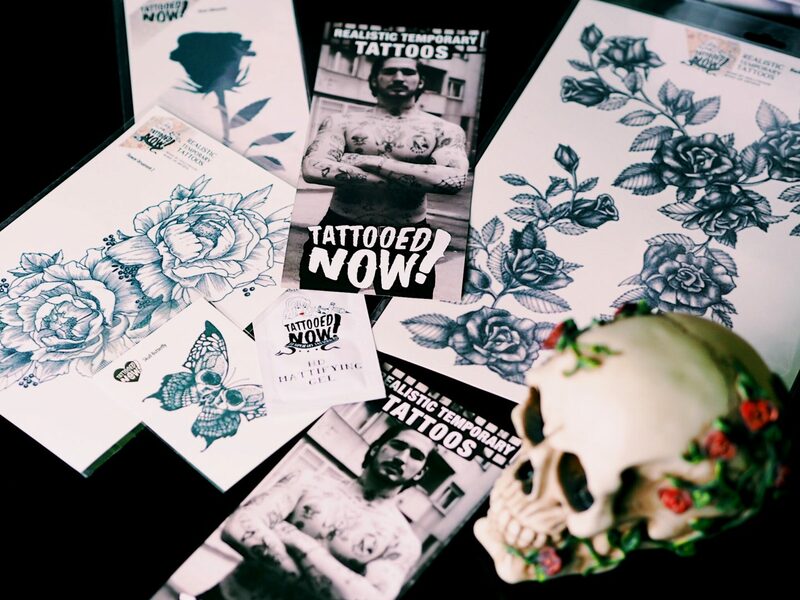 TattooedNow have such a huge range of designs too meaning there’s bound to be something that you’d like to try. This is anything from florals to skulls and traditional to tribal. If you did want something bespoke, you can also request a custom order which is pretty amazing! One of the best things about TattooedNow products is that they’re super reasonably priced, too. They’d be brilliant for parties and dressing up, photo shoots, pranking someone or even just to change up your look a little bit every now and again! The possibilities are endless. They last up to 7 days, are super easy to remove with baby oil (although I used coconut) and you apply them just like any other normal temporary tattoo – easy peasy! These are the ones that I chose to try out that I was kindly gifted. This reminded me of beauty and the beast and is similar to one that I’ve been wanting to get. It’s super cute but because it’s block black ink it did slightly crack on application. It was barely noticeable unless you looked up close, though! Again, this was really similar to some designs I’d been looking at getting so I thought it’d be great to actually see how it looked on me. It went on really easily and lasted well, too! I love anything with skulls and thought this design was rad as hell and awesome for the price. This is absolutely gorgeous and would look amazing literally anywhere. I went for the shoulder as I wanted to make more of a collective look with the tattoos I was given but it’d also look incredible on the thigh, arm, ribs etc. The list goes on! This was an A4 sheet full of tattoos hence the price! I absolutely adore this one. It did look slightly odd next to my real tattoos as their lines are much thicker and the ink is a little more blue. Although, when they’re altogether and seen like a big piece it looks so gorgeous and realistic. I got so many stares having chest/neck tattoos and it was quite hilarious but did make me feel confident! It’s made me so unbelievably excited to get them for real. After applying these, I tried out the TattooedNow HD Mattifier on top too and it did make the tattoos look even more realistic. It dulled down the slight sheen of them making them look as if they were literally just part of your skin. The website also recommends that you use their Blue Bird Matt Sealer to make your tattoo last longer. I unfortunately didn’t get to try this one so I cannot comment on it but they’re pretty long-wearing and waterproof anyway! They did start to crease a little during the night because of sweat etc though. I absolutely LOVED wearing these and would happily invest in them time and time again for fun. They are such great products to use for all sorts of things and I’ll definitely be trying some coloured ones next time just to see how they look. I thought my mum would go ballistic upon seeing me with them but she actually said she loved them and thought they really suited me! 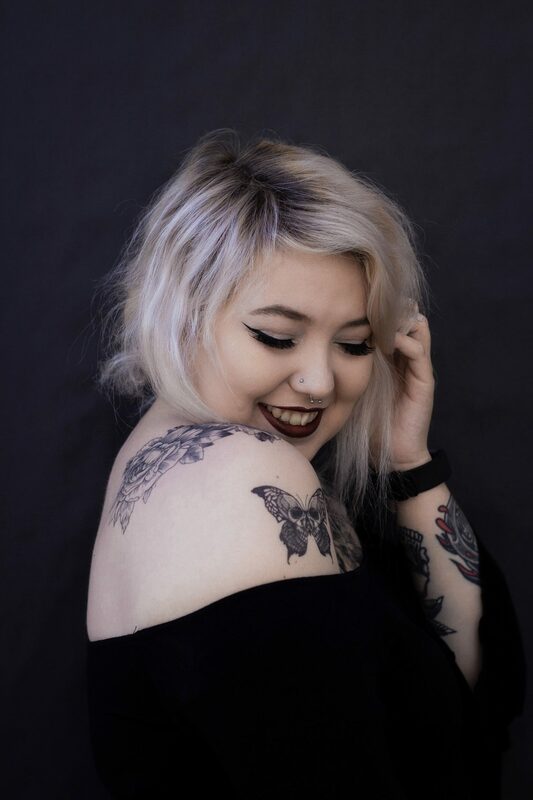 Nothing boosts my body confidence like tattoos do and I urge anyone to try them out as I can’t imagine feeling any different! What are your thoughts on tattoos and would you try a product like this before getting a real one? Struggling With Personal Style Identity! "Jolly Jelly And Ghoulish Goodies From Bomb Cosmetics!" These look brilliant, and are so great for the price! They really suit you! 😍 I think things like this are great if you want to try it, without the commitment. oh my goodness these are AMAZING!!! 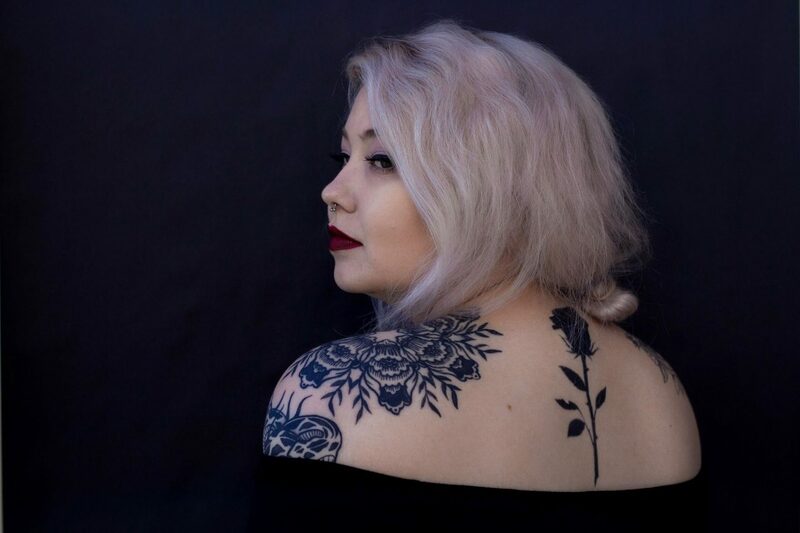 You look truly stunning in these photos and really suit the tattoo choices. I too don’t understand the criticism those who whose to ink receive and although I don’t have any I love looking at and appreciating the work that goes into them they are stunning works of art! I can’t believe how cheap these tattoos are and how realistic they look. Fabulous post that I thoroughly enjoyed reading thanks for sharing Alice. my goodness these look so realistic! 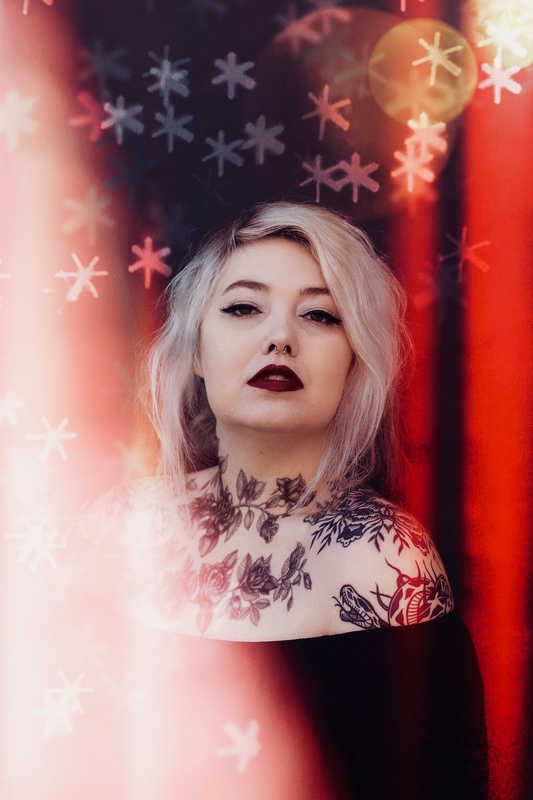 I have a few tatoos but they are expensive so its taking time to get all the tattoos I want, these sound brilliant and affordbale, will have to try them out. I always used to talk about all of the tattoos I wanted but still haven’t got ANY! I’m a bit of a commitmentphobe and worry that I won’t always love it. These would be amazing for me to try them out without committing, they look so realistic! 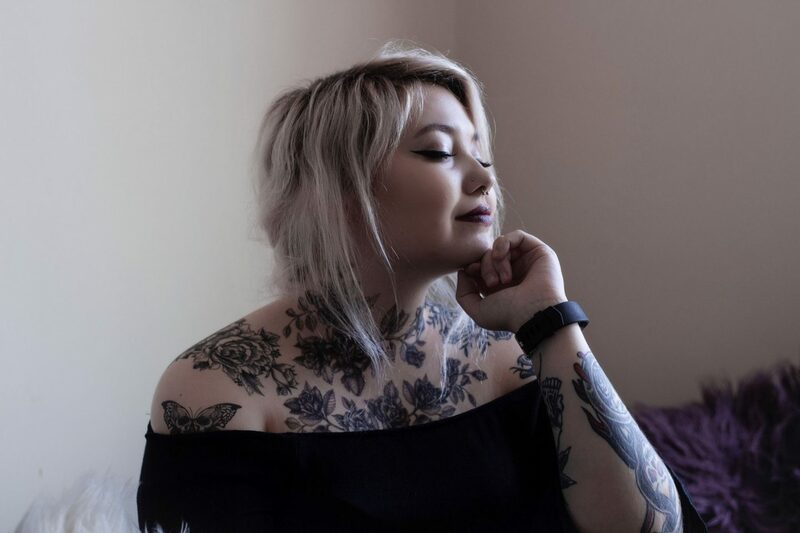 You suit tattoos so much and they look absolutely gorgeous on you! Oh my GOSH I’m living for these tattoos! I’m a massive perfectionist, and despite everyone always assuming I’m tatted to the gods (because of my piercings) I’m yet to break the tattoo V plates! These would be awesome in helping me choose a design and placement!!! These are amazing. I am going to give them a try. You look beautiful with them! Absolutely love this post and the products! I honestly thought the rose all over your chest and neck were real! It would really suit you and looks so beautiful on you! 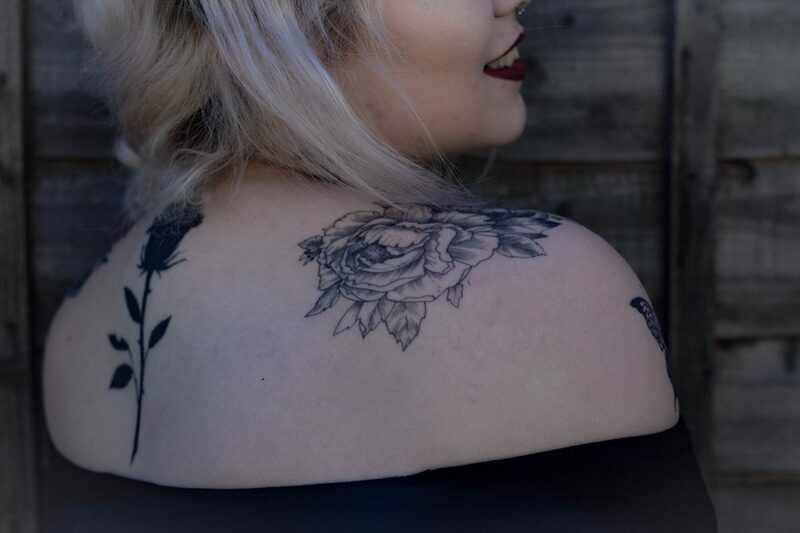 I’ve always fantasised about getting tattoos but I don’t know if I could do it, but temporary one’s would be great to get an idea of what it would look like or as a slight alternative! There was a time when I really wanted a tattoo and was that close to make the jump but was so afraid i would not like it once i have it. This would be the perfect alternative! the black roses are absolutely amazing and look so good on you! I love the designs you chose! They look amazing on you! I’ve definitely been thinking about tattoos a lot recently. As someone who loves art and design, I think tattoos are a great way to express your creative self. Great post! wow these tattoos are stunning! i couldn’t even tell they were fake and they are incredibly affordable, such a great post! I love tattoos so much! I’ve got 3 with more planned and no one really expected me to end up with more than one. This would be perfect for people who are scared to commit to one design! They’re so realistic I can’t believe they’re fake! They are so realistic… and I really want some! It’s perfect for testing out a tattoo before taking the plunge. Ah you look absolutely amazing, and this is such a good way to test out tattoos your interested in! I love tattoos! I only have one small one on my ankle, but I really want to get more as time goes on! I’d love something a little bigger perhaps, but am really indecisive so probably not gonna settle for a good while, it was a shock I got the ankle tat! These look gorgeous on you! I’ve always wanted tattoos but I’m no good with pain so haven’t got one yet, these seem like a great alternative! They look incredible on you! You need to get these for real now! OMG! those tattoos are stunning. I love the florals and the shadowing is perfection! I think it’s neat that you stuck with the vows of getting tattoos. You look gorgeous and love how everything is laid out. Big plus that it doesn’t cost an arm and a leg to have these temporary tattoos! I am a sucker for those black roses! Ok, here’s the real question. Where’s the black tulip tattoo? XD. Glad you liked Tattooednow! Wow! These look amazing on you and I love the idea of being to try out a tattoo before you get inked. I’ll definitely be trying out a few of my tattoo ideas with this. Thanks for sharing. For temporary tattoos these look SO real! The designs you picked out really suit you also. I would love to get a tattoo, I’m just a wimp! I think if I ever did get one they would be small and in places I can cover up – it’s just not me, but that’s not to say I won’t ever have one. Fingers crossed I man up as I want a couple real bad! Wow! they look so realistic. When i first saw this photo on your insta, i honestly thought they were. Really suits you though, you should so do it! !